About 2 weeks ago, Matt from DigitallyDownloaded.net and I were exchanging some emails, and he inquired about the game-play hours for Fortune Street. It had been almost a year since I had last covered the game, and you can read the first Nintendo Channel data report on it, HERE. It has now been more than a year since I covered the game, so let's take another look! Fortune Street released in the U.S. for the Wii on December 5, 2011, with a MSRP of $49.99. The game was developed by Square Enix, and published by Nintendo for its U.S. release. It received an ESRB rating of "EVERYONE" with "Comic Mischief" listed as content for parents and gamers to be aware of. A description for the game on the Nintendo Channel says, "Players race around the board trying to accumulate wealth and hit a target value while buying, selling and trading property with friends and family to see who can be the first to cash out. What appears at first to be a simple property-buying board game offers multiple levels of money-maximizing opportunity." The game has been out almost a year-and-a-half now, but how much has it actually been played? If you own a Wii or even now a Wii U, and skipped over Fortune Street when it released, how many hours might you expect from the game if you decide to buy it now? Brew yourself some coffee, and let's take a look at the official U.S. Wii Nintendo Channel data to see how many hours Wii owners have reported playing the game, and what the average hours "Per person" are reported so far! E3 is right around the corner and while Nintendo won't be holding their typical E3 press conference, they will be doing a Nintendo Direct for the Wii U on June 11th, and smaller conferences at E3 as well. The Wii U's first 3D Mario game is supposed to be shown this year, and even be at E3 in playable form (maybe even at the Best Buy E3 Wii U demo stations?). 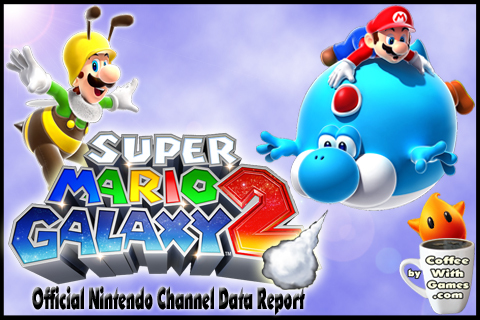 Before looking forward at the Wii U's first 3D Mario title, with whatever trailer and news Nintendo shares at E3, let's take a look at one of the Wii's 3D Mario action/platforming games: Super Mario Galaxy 2. Super Mario Galaxy 2 released for the Wii on May 23, 2010 with a MSRP of $49.99, and received an ESRB rating of "EVERYONE" with "Mild Cartoon Violence" listed as content for parents and gamers to be aware of. The game was developed by Nintendo's EAD studio, like the original Super Mario Galaxy was as well. If you own a Wii or Wii U and haven't played Super Mario Galaxy 2, but are interested in it, how many hours can you expect from it? Brew yourself some coffee, and let's take a look at the official U.S. Wii Nintendo Channel data to see how many hours Wii owners have reported playing the game, and the average hours reported so far! 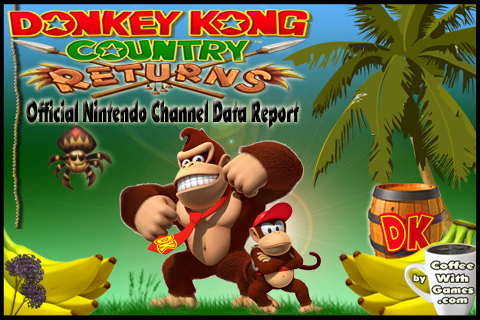 Donkey Kong Country Returns! How much have U.S. Wii owners reported playing? Official U.S. Nintendo Channel data report. Donkey Kong and Diddy Kong have been platforming buddies since the 90s. Sometimes they work together, other times they work to help the other out. It just depends which adventure you play. Donkey Kong Country Returns was one of Nintendo's surprise Wii games at E3 2010, and the game released on November 21, 2010 that same year with a MSRP of $49.99. 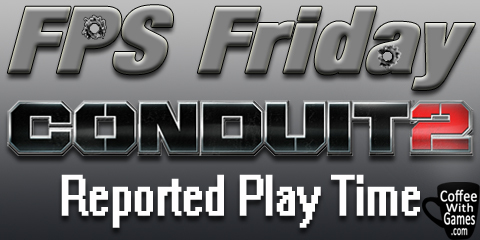 It was developed by Retro Games (known for developing the Metroid Prime games), and of course published by Nintendo. Donkey Kong Country Returns is now available for the Nintendo 3DS system with a MSRP of $34.99, and like the Wii version, it also received an ESRB rating of "EVERYONE" with "Mild Cartoon Violence" listed as content for parents and gamers to be aware of. If you own a Wii or Wii U, or now even a Nintendo 3DS, and are interested in Donkey Kong Country Returns (3D), how many hours can you expect from it? Brew yourself some coffee, and let's take a look at the official U.S. Wii Nintendo Channel data and the average hours reported! Are you planning on buying Donkey Kong Country Returns 3D for your Nintendo 3DS? If so, you might want to check out Best Buy's current pre-order bonus with the game. What might that be? If you pre-order the game from Best Buy right now, you will receive a download code for SMB: The Lost Levels for your Nintendo 3DS' Virtual Console, when Donkey Kong's new 3DS adventure releases later this week! You can see the details, HERE. 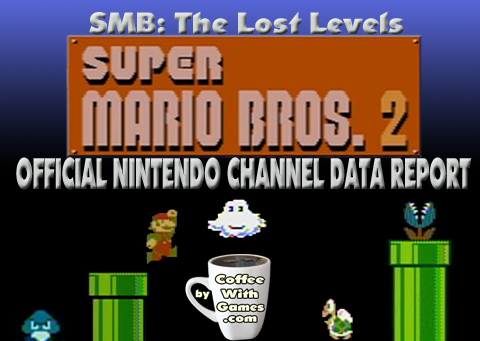 SMB: The Lost Levels was originally released for the Nintendo Entertainment System (NES) in 1986, but only in Japan. It was the true sequel to Super Mario Bros. in Japan, being called Super Mario Bros. 2 there. It never released for the NES in the United States, but thanks to digital distribution the original NES version finally did reach our shores in a more accessible way. Nintendo made SMB: The Lost Levels available on the Wii's Virtual Console service on October 1, 2007 and it is available to download for just $6 (600 Wii Points). 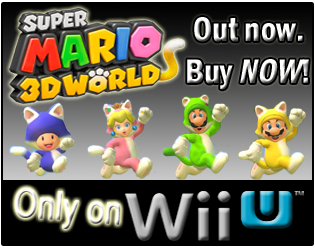 The game is also now available to download from the 3DS eShop for just $4.99. The game received an ESRB rating of "EVERYONE", on both systems, with no content listed for parents and gamers to be aware of. If you have never played the real sequel (depending who you ask, I know) to the original Super Mario Bros., how many hours can you expect out of the game? How many U.S. Wii owners have game-play data reported for SMB: The Lost Levels, since it released in 2007? Brew yourself some coffee, and let's take a look! Super Mario Bros. 2, how much have U.S. Wii owners reported playing? Official Nintendo Channel data report. Super Mario Bros. 2 (SMB2) was originally released in the U.S. for the Nintendo Entertainment System (NES) in 1988. Nintendo re-released SMB2 for the Wii's Virtual Console Service on July 2, 2007, and it is available to download for 500 Wii Points, which is $5. The game was just released for the Wii U's Virtual Console service this week, on Thursday. You can purchase it through the Wii U's eShop now for only $4.99, or you can currently get it 50% off if you buy Super Mario World at the same time. Both the Wii and Wii U versions of SMB2 have an ESRB rating of "EVERYONE" with no content listed for parents and gamers to be aware of. SMB2's description on the Wii U eShop says, "Mario, Luigi, Princess Toadstool, and Toad embark on a quest together to save the day against the villainous Wart. Pick up items and throw them at your adversaries to clear levels in seven fantastical worlds. Even enemies can be picked up and tossed across the screen. Each character has a unique set of abilities: Luigi can jump higher and farther than any of the other characters, Toad can dig extremely fast and pull items out of the ground quicker than anyone, and the princess is the only one who can jump and hover temporarily. This unique installment in the Mario series will keep you coming back for more!" 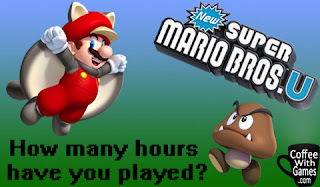 If you own a Wii or Wii U, how many hours of game-play can you expect from Super Mario Bros. 2? How many U.S. Wii owners have game-play data reported for the game, since it released back in 2007? 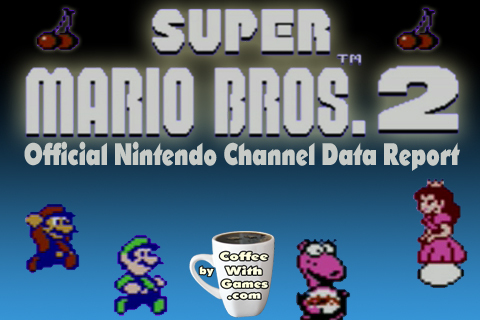 Brew yourself a nice, full, pot of coffee this fine day, and let's take a look at the official U.S. Nintendo Channel data for Super Mario Bros. 2! Coffee Shop! Game deals for the PC, PS3, 3DS, & Wii U! Amazon.com is running some pretty incredible deals on a good number of PC games right now, and along with highlighting some of those, there are a few PS3, 3DS, and Wii U deals you might be interested in. When I say incredible deals, I don't just mean 10% off titles. No, I mean some PC titles 75-88% off their "List Price" on the site. You also don't need any special coupon(s), special code(s), or special pass phrase(s) to get the deals. 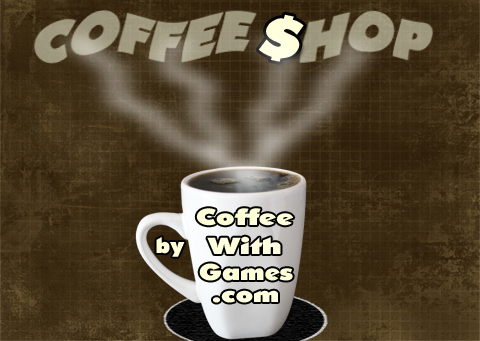 Brew yourself some coffee, and hit the jump to see what games you can find! Super Metroid! How much has it been played? Official U.S. Nintendo Channel data report. Super Metroid originally released for the Super Nintendo Entertainment System (SNES) in 1994. The game was re-released for the Wii's Virtual Console service on August 20, 2007, and is available to download for 800 Wii Points, which is $8. Nintendo just released Super Metroid for the Wii U's Virtual Console service, and you can currently purchase the Wii U version for only 30 cents until June 13th, and then the game should be available for $7.99. Both the Wii and Wii U versions received an ESRB rating of "EVERYONE" with "Mild Violence" listed as content for parents and gamers to be aware of. The software description for the game on the Wii U eShop says, "The Space Pirates, merciless agents of the evil Mother Brain, have stolen the last Metroid from a research station, and once again Mother Brain threatens the safety of the galaxy! Samus Aran must don her awesome array of high-tech weaponry to retrieve the deadly Metroid hidden deep within the cave-riddled planet Zebes. Super Metroid features excellent graphics, with a huge variety of enemies and worlds to explore. The side-view action will be familiar to many players, only now there are new weapons and items, including the Grappling Beam, which allows Samus to swing across large chasms, and the X-Ray Scope, which reveals secret passages." If you own a Wii or Wii U, how many hours can you expect from Super Metroid? Also, how many U.S. Wii owners have game-play data reported for the game through the Nintendo Channel, since it released in 2007? 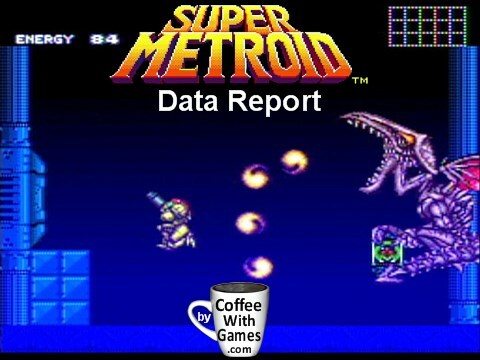 Brew yourself some coffee, and let's take a look at the official U.S. Nintendo Channel data for Super Metroid! Movie Magic Monday! Iron Man's average hours, total hours, & review scores averages. Official Nintendo Channel data report. Iron Man 3 released last Friday, and is doing a nice job of wracking up hundreds of millions of dollars. With Iron Man 3 having just released last week, for this Movie Magic Monday feature we're taking a look at the first Iron Man video game on the Nintendo Wii. Iron Man was developed by Artificial Mind and Movement, and published by Sega. The game was released on May 2, 2008 and received an ESRB rating of "TEEN" with "Alcohol Reference, Mild Language, Violence" listed as content for parents and gamers to be aware of. A description for the game on Amazon.com says, "Iron Man, one of Marvel's most indestructible Super Heroes, is blasting onto video game platforms and the big screen next year (2008). The epic, action-packed Marvel Studios production will be directed by John Favreau and stars Robert Downey Jr., Jeff Bridges, Terrence Howard and Gwyneth Paltrow. This third-person action game will immerse players in explosive militaristic combat from the film with loads of additional content created exclusively for the game." The original Iron Man movie has a runtime of 2 Hours 6 Minutes, but how many hours can you expect from the Iron Man video game? Did the "additional content created exclusively for the game" as the game's description says, add more hours of "explosive militaristic combat" to the game than what the movie provided viewers? 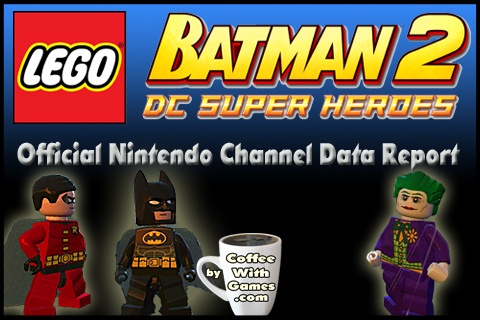 Brew yourself some coffee, and let's take a look at the official Nintendo Channel data for Iron Man! 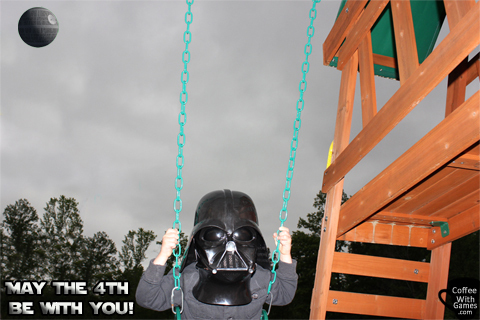 May the 4th, was it with you? What is the Wii's least played Star Wars game? Official Nintendo Channel data report. That's no moon, but that might be Bean 1. Speaking of Star Wars video games, there were at least six retail Star Wars games released for the Wii and at least three Star Wars games released on the Wii's Virtual Console service, from my count. We own three of the Wii retail Star Wars titles, but only two of them have been played. The game-play "Force" (if you will!) was very strong behind the Wii Star Wars retail titles, with each of them now having more than one million "Total Hours" of game-play reported. But, which Wii Star Wars retail game does the "Force" appear to be the weakest with, resulting in the lowest amount of replay value? Brew yourself some coffee, and let's take a look at the least played Star Wars Wii retail game based on the average hours reported "Per person". 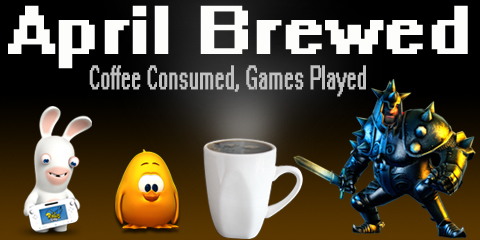 April was a busy month for gaming around here, and while the amount of coffee consumed in the month stayed the same, the number of blends brewed in the month was pretty low from previous months. There was no April Fools post, like one in a previous year, but there was a debut data report, a WiiWare Wednesday post, and even one of my more rare opinion pieces! 1) Do you enjoy playing darts? You might want to download the free WiiWare demo for Dart Rage and try it out, and you can see its official U.S. Nintendo Channel data report, HERE. 2) Want a highly rated Wii fishing game? If you own a Wii or even a Wii U, you should check out Fishing Resort. 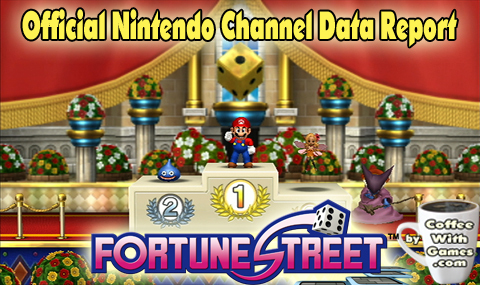 Its official Nintendo Channel debut data report, HERE. 3) Was Xenoblade Chronicles good? Apparently so, and it had a solid number of hours reported over its first year. You can read its official Nintendo Channel data report, HERE. 4) How many hours can you expect to play Red Steel 2 before beating it? You can see the average hours reported "Per person" for the game in its official Nintendo Channel data report from last month, HERE. 5) Have you been interested in getting a Kirby game, but wanted to know how many hours you could expect? If you own a Wii or Wii U, I would suggest starting with Kirby's Adventure from my short time with the game so far. See how much the Wii version was reported to have been played since it released, in its official U.S. Nintendo Channel data report posted last month, HERE. 6) Yes, I covered a darts game and a fishing game in April, but I also covered one of the Wii's best racing games (my opinion, I know) where you could play darts and fish randomly, DURING races. If you skipped ExciteBots: Trick Racing, you can see the average hours you might expect from the game, HERE. Now, what coffee(s) did I consume and games did I play in April, even seeing the credits roll in one? Brew yourself some coffee (seriously, wall of text below! ), and let's take a look! This is short, and simple. During April we only brewed up Maxwell House Gourmet Roast coffee. We did go through one full container of it in April though, and the second container which we bought in April is about empty. Mrs. Coffee enjoys the blend a lot, and I think it has a nice, solid, flavor as well. 39 hours, or 20 hours? Which one was it? I did leave the game paused/on quite often, so being near 40 hours overall doesn't surprise me (the Wii U cut off several times due to the game being paused for an hour). I just wonder if the 20 hours shown are more of a direct reflection of when I was actually moving in and playing the game? I thought that perhaps my play time was around 15-20 hours when I had completed it, before even looking at the time(s) on the file. Overall though, I enjoyed my time with the game, and it offers a lot of content (notice in my save file image, I finished the game with only 37% of it complete). LittleBigPlanet - Bean 1 really enjoys this game, and laughs hysterically when certain things happen in it. It could be Sackboy falling in a hole, getting pounded by something in the level, or just racing vehicles in levels and watching them make jumps. I am volunteered by him to play some of the levels every now and then, and this is how I ended up playing LBP in April. I didn't play it a lot, but I did beat a few of the levels when I would randomly sit down to play it. I'm not sure how much we have really progressed in the game, but I do enjoy it when I play it. Nintendo Land - Bean 1 and I played some matches of Animal Crossing: Sweet Day, Luigi's Ghost Mansion, and Mario Chase. We also attempted a few rounds of Metroid Blast, so he could start learning the controls in that mini-game as well. Bean 1 played Donkey Kong's Crash Course on his own, and I showed him a trick (a few months ago) to get around the blowing in the microphone aspect, which results in hilariously loud "GO! GO! GO! GO! GO! GO!" phrases at the Wii U GamePad. It works, and if you don't like blowing into the GamePad's mic, or have little kids that may run out of air quickly, just teach them to talk to it loudly. Bean 1 also played Yoshi's Fruit Cart, and is incredibly good (for his age!) at Pikmin Adventure! I think Nintendo Land will continue to be a slow burner for us, with some months where it's played a lot, and other months perhaps not at all. 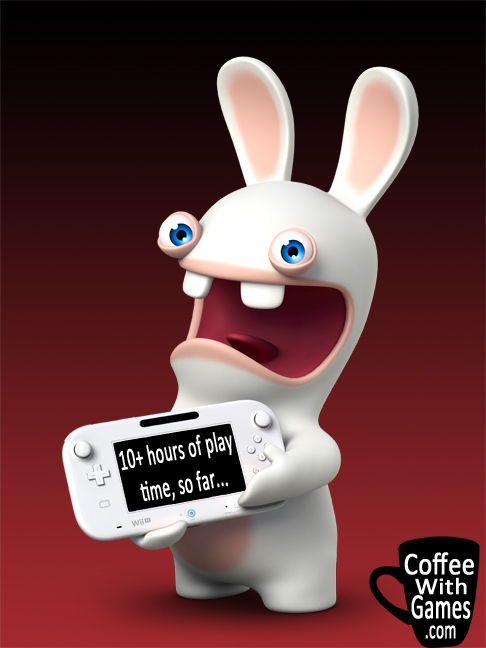 Rabbids Land - Last month in my March Brewed post I asked, "How many hours does it take to unlock all the mini-games in Rabbids Land?" I already had more than 10 hours of play time logged for the game, but still didn't have all the mini-games unlocked. Well, I unlocked the rest of the Rabbids Land mini-games in early April, and my current play time is now 12 hours 21 minutes. Sonic and All-Stars Racing Transformed - I'm making some slow progress in this one, but still really enjoying the game. I'm working my way through the game's career mode and unlocking new tracks, and leveling up some of the racers in the game (slowly, but surely). Toki Tori 2 - I ran out to Best Buy in early April to grab a Wii U eShop card. Why? We had some saved up Best Buy Reward Zone coupons, that almost covered the price of the eShop card, which I planned to use to grab Toki Tori 2 and other Wii U eShop games. I did end up getting Toki Tori 2, but without having to use my eShop card! I have enjoyed my short time with the game, and some of the puzzles I have encountered so far are incredibly well designed. Do you know the names of these characters? 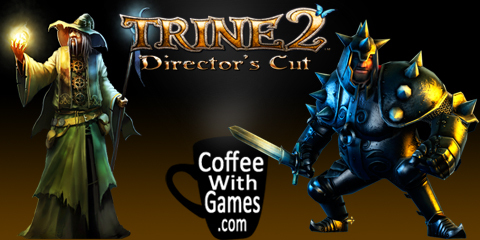 Trine 2: Director's Cut - If you have played Trine 2, you may remember how the levels in the game have hidden items scattered about. After I finished the game's main campaign (saw the credits roll) a few months back, I had been going back and attempting to find the items I had missed in the different levels. In April, I found all of the hidden map pieces, and finally unlocked the Wii U's exclusive level! World of Goo - Bean 1 can start this one up on his own, and he is even beating some of the levels in it. I played some levels in the game with him watching, and I'm not really sure how many more levels we have left (if any), because we have reached one, and I'm not really sure what to do in it. It's gotten a good bit of play time though, and was well worth the price of admission I paid for it, which I think was around $1. Mario Kart DS - I don't how many times I played the different mini-games in this one during April, but it was a good bit. One thing I am learning though, Bean 1 will probably soon be able to beat me in a race! He's doing power-slides, finishing first in many races, and even completing entire cup races in first. Having Mario Kart on the go is a nice option for him in the car, and it's gotten a lot more play time these last few months from Bean 1 (and I) playing than it ever did in the many years before. Mario Kart Wii - We have had Mario Kart Wii in our collection for a few years, like Mario Kart DS, but I think because of Bean 1 the game has actually been played more recently, than the past years combined as well. I really enjoy just listening to the music in some of the levels, and I think Moo Moo Meadows is probably my favorite track right now because of its tune. Bean 1 is pretty good in this one, but the items in the game are pretty ridiculous. He'll often be in 1st place approaching the finishing line in the last lap, then get hit with by a Spiny Shell ( the evil blue shell! ), sometimes followed up by consecutive hits from Red Shells. He sometimes gets frustrated when it happens, because he's understanding finishing the race in different places gets different points now, and I get frustrated for him when I see it happen! 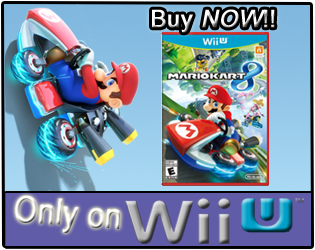 I really hope Nintendo balances Mario Kart U, more than Mario Kart Wii. New Super Mario Bros. U - I beat the last level in New Super Mario Bros. U, again, in April because Bean 1 had attempted it a few times on his own. We usually run around in the game just playing random levels now, and Bean 1 actually enjoys running around the world map, launching from the cannons randomly placed around it. We started playing some of the "Challenges" and "Boost Rush" levels under the game's "Play with Mii" section, and even Mrs. Coffee attempted a few of the Boost Rush levels. 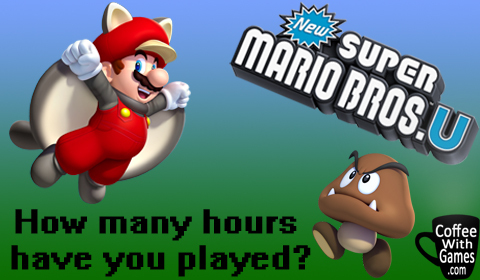 How many hours have we played New Super Mario Bros. U? According to our Wii U's Daily Log channel, our play time is currently 30 hours 13 minutes, over 20 "Times Played". If you finished the main campaign of New Super Mario Bros. U, have you found yourself going back and playing the game more? Super Mario 64 - I still haven't finished this game! We have collected 20+ stars though, and the file has not yet been deleted, so we are making some progress. Bean 1 enjoys running around the castle and different levels, and can even complete a few of the hunts for stars in the levels. This one seems to be a slow burner for us, played pretty randomly, but we definitely enjoy it when its played. Kirby Mass Attack - This is a new one that is now in our collection! With how much Bean 1 was enjoying Kirby's Adventure on the Wii U, I took advantage of an Amazon.com sale on Kirby Mass Attack last week and grabbed it for him for just $12.72. Not only have Bean 1 and I played the game, but Mrs. Coffee has as well. So far, we're enjoying the game and the touch screen mechanics haven't really given Bean 1 any trouble. Seeing how well the touch screen controls work in the game (from my time with it anyway, not sure if the later stages represent any problems? ), I think it'll be interesting if Nintendo releases a Wii U Kirby game like Mass Attack, where the GamePad's touch screen is the main (or, even only) way of controlling the game. The quick "Instant Coffee" list of games (also including demos) I played in April is: Super Mario 64, Assassin's Creed III, World of Goo, Rabbids Land, Toki Tori 2, New Super Mario Bros. U, Mario Kart DS, Sonic and All-Stars Racing Transformed, Mario Kart Wii, LittleBigPlanet, Kirby's Adventure, Trine 2: Director's Cut, Kirby Mass Attack, Fat Princess, Rayman Legends Demo, Rayman Legends Challenges App, and Nintendo Land. Did any of you perhaps get a new game in April, like how Kirby Mass Attack joined our collection? If so, what game(s) did you get, and have you enjoyed it? As always though, what games did you play in April (even if not necessarily "new"), and coffees did you consume during the month?